Karadaiyan Nombu, or Savitri Nombu Vratham, is a Tamil observance in which married woman prays for the well being and long life of her husband. Karadaiyan Nombu 2019 date is March 14 and time of breaking of fast and to wear Saradu is between 5:10 AM and 5:25 AM on March 15 before sunrise (India Standard Time). The exact time of Panguni month beginning is at 5:40 AM on March 15. In USA, it is on March 14. In Australia, Malaysia and Singapore it is on March 15. It is observed on the particular day when the transition between the Tamil months Maasi and Panguni takes place. Karadai is the name of a unique nivedya (holy dish) prepared on this day. Nombu means Vratam or upvasam (fast). Update - You can find the USA, Australia, Singapore and Malaysia time of beginning of Panguni month here. Karadaiyan Nombu is observed in remembrance of the Satyavan – Savitri legend. 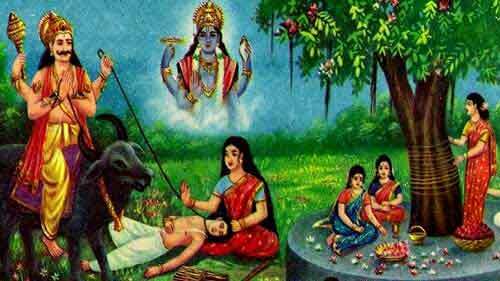 A princess, Savitri through her unparalleled devotion saved her husband, Satyavan, from the clutches of death. This legend is very popular in India and there are several other observances based on this legend like the Vat Savitri Puja. Savitri Nombu Vratham is observed at the exact time when Masi month ends and Panguni begins. On the Vratam day married women fast and break the fast by eating the Karadai preparation with butter. The preparation is known as Karadaiyan nombu adai - the festival takes its name from the unique Kara Adai dish. It is believed that Savitri cooked such a dish and offered it to Lord Yama along with unmelted butter as a sort of thanksgiving for sparing her husband’s life. Another important ritual is the wearing of the Karaadai nombu saradu, which is a yellow thread, around the neck.